This part was designed with a compression limiter feature on the head to prevent overstressing of a soft base material, and act as a spacer between 2 assembled components. Sherex engineers designed a special knurled rivet nut to provide additional spin-out resistance in an application with soft base material. The knurl design allows for increased engagement with the base material, while the small flange provides near flush installation. Click here for more examples of specialty Sherex fasteners. Favorite Thing About Working at Sherex: The incredible work atmosphere that is created by management and their willingness to address employees' workplace needs. Favorite Project Worked on at Sherex: Process improvement projects. I really enjoy utilizing my creative problem solving skills to support our goal of continual improvement. Favorite Hobbies and Activities: When I'm not at work, I like to spend time with my wife, Leslie, or play hockey with my friends. I recently competed in the 11 Day Power Play, a marathon hockey tournament that raises money for our local cancer research center. I’m most proud of the path I’ve taken to get to where I am now. 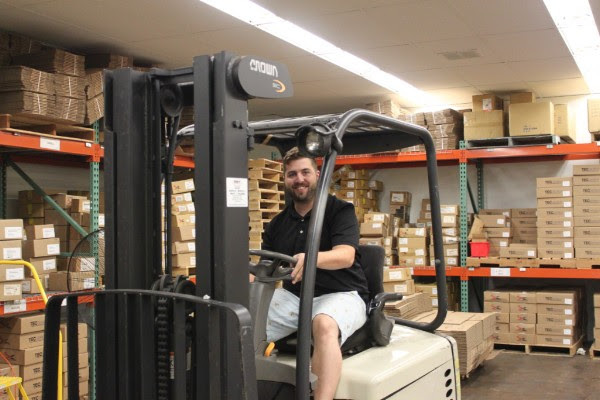 I started as a parttimetemp, and quickly became a full-time order picker. After a year in that role, I expressed interest in a receiving coordinator opening, was awarded the position and successfully managed that role for some time. Eventually, a strategic account representative position became available, I applied for that role and got the job. I’m now the Assistant Warehouse Manager, responsible for production planning, internal operations within the warehouse, and process improvement projects. Every day I learn more about my position, the company, and the fastener industry in general. Sherex's engineering team designed a line of M10 full hex structural rivet nuts. The OEM was having challenges with weld nuts in frame assemblies: in order for the bolt to be installed correctly, they had to mask then unmask the weld nut threads before and after the powder coat process. These extra steps were causing delays in the manufacturing process. They needed a high performance, high strength fastening solution that did not require multiple steps. Sherex engineers created a cold formed full hex rivet nut from alloy steel to meet the application's strength requirements and recommended the FLEX-18 rivet nut installation tool. The new rivet nut provided the high performance required and eliminated the need for the two-step thread masking process; increasing throughput. When used in combination with the FLEX-18, production time was reduced by 20 minutes per frame assembly. Click here for more information on Sherex full hex rivet nuts.